One thing I observed is that when I have both inputs connected it gives correct RPM, when I have only one input connected I have half of the actual rpm. The b4 has an I4 motor with cylinders 1 & 4 firing off one coil and 2 & 3 on the other. Someone would expect that connecting to one coil would get the actual rpm number since there would be one firing event every 360 deg. Or am totally wrong? So every time 1&4 approach TDC it fires that coil, and every time 2&3 approach TDC it fires that coil. With the Tach Driver Module hooked up to both coils it would be sensing an ignition event every 180 degrees of crankshaft rotation. 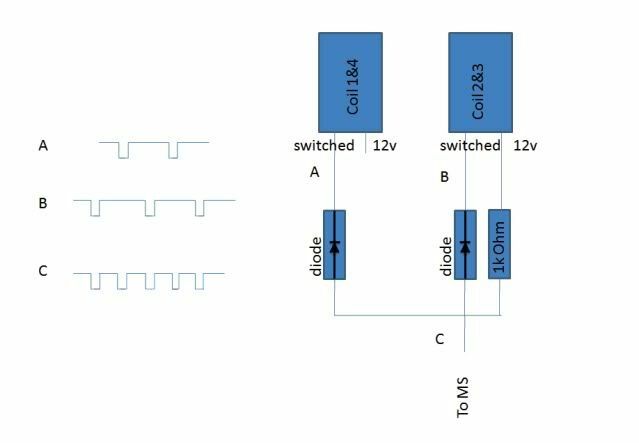 The only answer to the question has to be that this Tach Driver Module you're using (the one they designed for I4s and I2s that use two coils) is designed to divide the number of ignition events it senses by 2. So if you only hook up one coil and then the Tach Driver Module divides by 2, you'd get 1/2 the actual RPM. When I tried to restart the motor it would not start most of the times or would start up but die immediatelly. A couple of times it fired up but no steady idling and any attempts to rev it resulted in engine stop. Hooked up the pc with Megatune and found out that RPM when cranking and at the few seconds of running were just about half of the real RPM. Assuming that the TachoModule may be failing I removed it and connected OPTOIN directly to coil's negative terminal, only to find out that I get no RPM signal at all. I haven't found the time to deal with it properly. Measured voltage on coil cables and it looks like it works but I'd like to pull out the spark plugs and do the standard test to see if the coil is actually firing. Also connected temporarily OPTOIN to the other coil but no change. Though I am not sure about this since it was an on the fly connection with loose cables barely making contact. I will attempt once again to connect to the other coil, but make a proper connection this time and see if this improves things. Anyway I think an osciloscope can reveal more about RPM signal and its quality. How about you, did you try out the TachModule on your project? Last edited by tubular on Fri Aug 05, 2011 10:40 pm, edited 1 time in total. tubular wrote: ...On the other hand in one of the datalogs I can see an RPM signal of 22K RPM while cranking... ! Almost certainly noise, maybe AC interference from the alternator, as I have seen this one before. Too true, everytime there are austerity measures, the working man always get it worst, never the politicians! I certainly hope that it is something related to wiring. I'd hate to find out that I have killed the ECU. But the thing that bugs me if it is a "noise" issue is, why it appears now all of a sudden and not earlier or even from the begining. I am thinking of reloading ECU firmware, upgrade to 2.890 and reconfigure the MS from scratch instead of loading a saved msq. Last edited by tubular on Fri Aug 05, 2011 10:41 pm, edited 1 time in total. But the thing that bugs me if it is a "noise" issue is, why it appears now all of a sudden and not earlier or even from the beginning. Vibration can kill connections, and the resistance/grounds shift or the battery could be in a different state in day to day use and the alternator is loading the system, or as you say, you can get firmware corruption every now and again, so you'll have to reload the code. Man if you were around I'd gladly buy you a beer or two.
. So I got the 2-input version because my motorcycle uses two independent coils, one coil fires cylinder #1 and the second coil fires cylinder #2. But somehow my reasoning was incorrect. I connected the Tacho Driver up, the white wire to the OPTOIN+ then one orange wire on coil #1 and the other wire to coil #2. When I cranked the bike I got twice the RPM indicated on the bike's tachometer. I then cut the orange line off of coil #2 and cranked it again with only the one orange wire still connected to coil #1. This worked perfectly. Even though it's a strange installation situation this Tacho Driver had given me much better results than anything else I've tried on the project so far. How to get a good tach input signal to the MicroSquirt has been the biggest problem in my project and has had me stumped for a while. Yesterday, with this new (weirdly installed) Tacho Driver I was able to go over 11,000 RPM during a 20 minute test ride. I hope your MicroSquirt is okay. A while back when I was desperately experimenting with every imaginable combination of resistors and diodes, trying to find a combination that would give me a good tach input to the OPTO circuit, I accidently burned out something inside the MicroSquirt and had to send it back to DIYautotune to be fixed. Here's a little update on the "tacho driver".... It just didn't get the job done. RPM spikes and dropouts, and some odd behavior during cranking. So I've tossed it. I had to go with a different solution, one that was suggested to me by another guy a while back but I never got around to trying. Very simple and works great. Here's the drawing for a 4-cylinder application like yours. I just trimmed off the left side (coil 1&4) for my 2-cylinder application. Many thanks to Matt_GSXR who I got it from. Now I'm actually (finally) putting together a "microsquirt success story" for my Kawasaki EX-250. Congratulations on the running project and thanks for sharing the tip. I searched the forum a bit and came accross threads which describe same or similar problems. In most of these there is a reference to a resistor (R20: 680Ohms, 1/4W) being damaged by coil voltage. Solution recomended is a 10K resistor inline with the OPTO IN+ . Your proposal is quite similar I think, so I'll definitelly give it a try. What diodes are you using? I have borrowed an O-scope and will be checking a variety of connections with and without the tachmodule installed so to see what are the signals for each connection scheme. If anything worthmentioning turns up I'll try to make some decent photos and upload so stick around. The diodes are just IN4003 silicon diodes purchased at Radio Shack (that would be Radio Shackopoulos or Radio Shackos where you live). From my "no electronic skills" background I only know that the IN400X family of diodes, IN4001 IN4002 IN4003 IN4004.....etc. only differ in the amount of "peak inverse voltage" they can handle. The IN4003 is rated at 200V of peak inverse voltage. It's pretty easy to fry the R20 in a microsquirt. I went back and looked at my paperwork from DIYautotune and that's what they had to replace in my microsquirt. When you get your microsquirt back into running order you definitely should try this solution (the Matt_GSXR diagram) because while it may sound similar to other solutions, it isn't. The other solutions that people offer have you trying to reduce/mitigate the ugly voltage characteristics of the bike's coils with things like a zener diode. The Matt_GSXR circuit is better because it completely blocks everything on the coil line and triggers the microsquirt only by allowing nice, clean, smooth, gentle (1K ohm resister) power to flow when the bike's coil is triggered by the stock ignition. It's a very simple circuit, but it's a world of difference from bringing that huge electrical mess from the coil into your microsquirt.